We were in this customs lots for over 3 hours. As I squeeze myself onto the already packed bus in Yamoussoukro I can tell that people weren’t all too pleased with my presence, nor that of my giant backpack which needed to be plopped in the middle of the aisle. A young girl, around the age perhaps of seven or eight, is shoed from her seat and told to sit in the aisle to make way for “le blanc”. I can tell there has already been some jostling on this bus that has come from Abidjan, tensions are high. As I look around at the seats which sit 5-across rather than the normal 4 and the bags piled into each free space, I can tell the trip from Cote d’Ivoire to Mali isn’t going to be a normal journey. The tin roofed bus and its large windows draw in heat like a leather seat and the temperature of the bus is hardly bearable as we finally leave town. The wind flowing through the open hatch in the roof only barely tempers the overheated mood. Only a couple hours in, and more than a dozen stops, I can tell this is going to a longer journey than the 24 advertised. As the afternoon sun begins to settle below the horizon I hear a scream, followed by a yell, and then a mass of rushing bodies. A young child decided it was a good idea to pee all over the floor of the bus, the merchandise of an older woman, and the feet of a few neighbours. As is quickly becoming a ritual, the bus stops and everyone unloads; a process in itself that seems to take 45 minutes. The breaks themselves are never far between either. There is always the need for 10 people to stop and have a meal, the driver to have a half a pack of cigarettes, the women to have a pee in the ditch, and for everyone but myself to find a place to pray. For every hour we spend moving, we spend at least the same stopped waiting to move. It’s painstaking. However, as the night begins to blanket the bus in a wash of solid dark, the passengers seem to all come together. It’s been a long day, but rather than begin to tear each other to pieces, friendships form and the tensions of earlier in the day are all washed away. Songs begin to be sung from different sections of the bus. When things get too silent someone pulls out their cell phone and allows their music to play through the air. 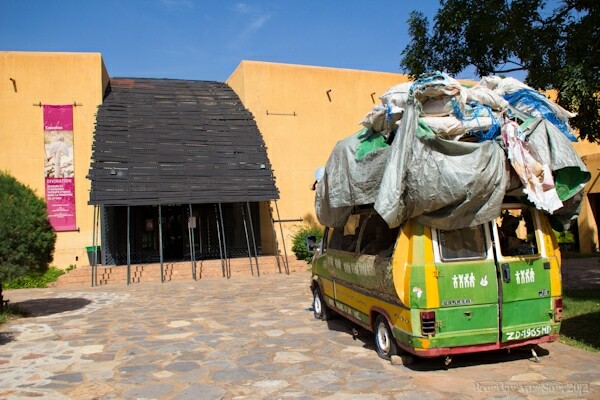 Even talk of the recent conflict in Mali seems pleasant rather than abrasive, Stories begin to be told and laughter spreads through the bus as the bond of travellers beings to be sealed. The night presses on and we are still nowhere near Mali. The bus stops and a passenger explains to me that the driver doesn’t want to continue any farther. The road ahead can be dangerous at night as there are groups of bandits that at times rob buses and trucks that pass at night. Bus hijackings are a real risk here at night. 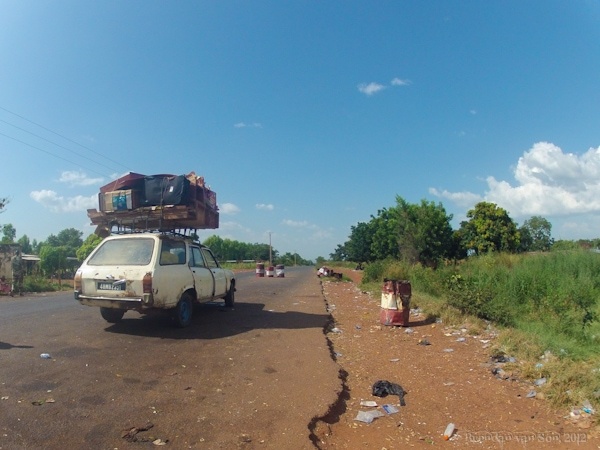 In fact, one passengers tells me that the driver of a truck was murdered by a group of bandits just the other day. We could continue on, but there is no point as the border is closed anyways, it’s not worth the risk. Passengers begin to scatter as the driver explains we’ll be leaving at 5am. Some people head off on the backs of motorcycles, others wander directly in the direction of the coffee and sandwich stand, and some women pull out mats and curl up to sleep. I draw a stool at a table and order an omelet sandwich and a coffee while asking someone if it’s safe to sleep there. They all laugh at me, before assuring me that I’ll have no problems. I assure him it’s not the case, and that I would have even asked that in Canada. I’m not sure I would have. But then again, we don’t stop driving at night because of the potential of bus hijackings in Canada. The parking lot is bright so I find a flat spot of pavement between a rusted out bus and an old tractor and layout my sleeping bag. I look up at the sky and am reminded of the time I rode the Iron Ore Train in Mauritania. The stars were more forcefully then, but I had the same sort of feeling flowing through my bones: one of excitement and adventure. And really, how could I possibly close my eyes and sleep with the Milky Way dancing so beautifully above me. As morning comes and we prep to again mount our bus, which is beginning to feel like a prison, I can sense that a few of the passengers have a new found respect for me. “Usually they fly!” I reply with a smirk, partly wishing I had. 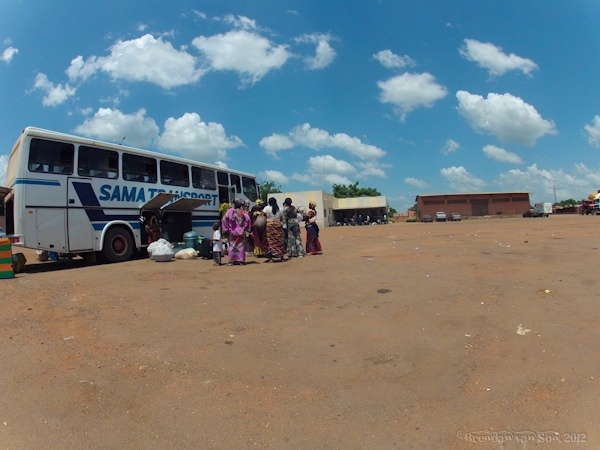 High noon comes quickly as we cross the border into Mali but time begins to stand still as customs officials have decided to check each and every piece of the baggage on the bus, a feat that leaves us standing in the African sun for three hours. After two hours, the boy who had peed on bus earlier atones for himself as he whips it out and pees on the pesky custom official’s leg. It was a moment none of us could stop from laughing at, even if it likely did cost us an hour more in the sun. 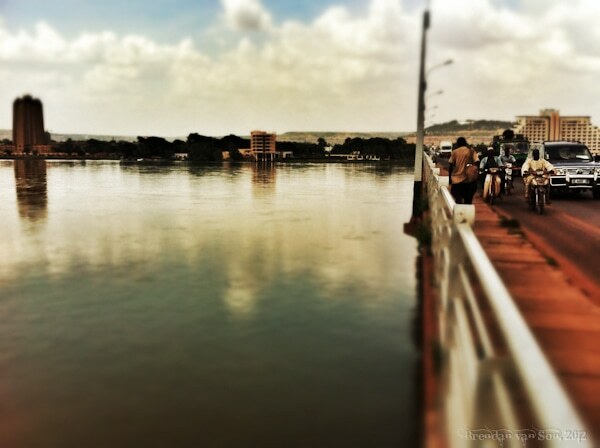 For a second night in a row, I watch the sun set on the horizon from the seat of the bus, and well after midnight we finally arrive in Bamako. But a funny thing happens when we get off the bus, we all kind of stick around. Though we have been trapped with each other for over 36 hours we can’t say enough goodbyes, shake enough hands, and wish each other enough good luck. In many ways, it’s the West African way. Bus rides last longer, time passes slower, and even greetings and goodbyes are drawn out. But no matter how hard that journey is, the West African heart makes it hard to have anything but fond memories. You won’t find me rushing to every get on that bus again, but due to the smiles, stories, and laughter I shared, I’m glad I got on in the first place. Sounds like quite the ride, what a great part of the world to be exploring! It is quiet shocking for me that still people have to travel in such vehicle in this miserable condition. Loved this article! One of those experiences that may be hellish while it’s happening but is fabulous to look back on. And great material for a writer! Yeah, there are few bad experiences… just great stories to tell! Wow. What an experience. Did you get much sleep? 🙂 Although I’m sure it was a difficult journey, seems like a great way to meet a lot of people.